A FLIGHT from New Orleans to Orlando was forced to make an emergency landing after part of the engine tore away from the plane mid-air. Southwest Airlines flight 3472 had just taken off from Louis Armstrong International Airport in New Orleans when passengers said they heard an explosion. "There was smoke and then nothing. I saw parts flapping in the wind because it was right outside my window," a passenger told KOCO in Oklahoma City. The man said the plane began to shake violently and descend rapidly. Oxygen masks fell and children began to cry. "I held my kids. One was freaking out, crying," she said. "And so, we're trying to hold his hand and singing and praying a lot." After the plane stabilised, the passenger said one of the pilots walked out of the cockpit and said one of the engines was lost, WCVB reported. The plane landed safely at Pensacola in Florida. A Southwest spokesman said its initial reports indicated no injuries were reported among the 99 passengers and five crew aboard. 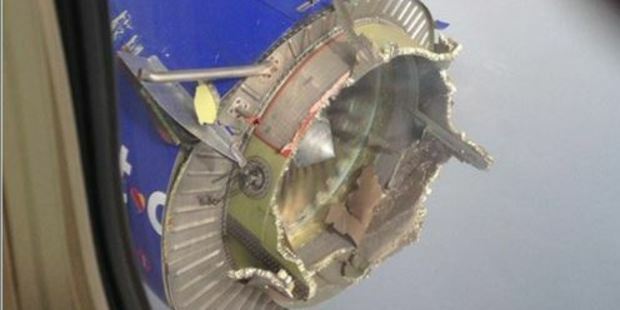 The Wall Street Journal said photos taken aboard the flight showed the Boeing 737-700's engine inlet completely torn away, revealing extensive structural damage to the engine nacelle that hangs underneath the wing. The spokesman said the failure caused a depressurisation of the cabin. The jet's fuselage, front edge of the wing, horizontal tail stabiliser and winglet were also damaged. It was unknown what caused the failure.